Regular eye examinations ensure that you have the best level of vision possible. They also reassure you that your eyes are healthy. Our private eye examinations last about 45 minutes and is tailored to your individual needs. It will include an 3D laser OCT scan to help detect eye diseases as early as is possible. This scan is quick and painless and we can view the results straight away. 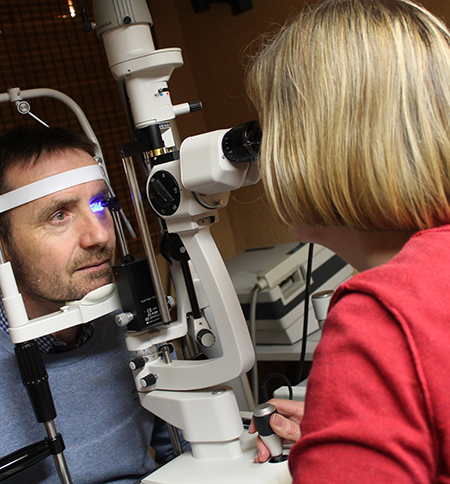 Detailed retinal examination, intraocular pressure assessment and computerised visual field assessments can all be a part of your bespoke eye examination as required to meet your individual needs. Afterwards, your Optometrist will discuss with you the best ways to satisfy your optical requirements according to you lifestyle. This may include not only differing designs of spectacle lenses and frames, but also contact lenses and sunglasses. If there are any underlying signs or symptoms of eye disease, your Optometrist will refer you for futher investigations and treatment. It is recommended that adults have their eyes examined by an Optometrist at least every 2 years. Optical Coherence Tomography – OCT, is a specialist scan that, until recently, was only found in specific hospitals across the UK. An OCT creates a 3D image of the back of your eye (the retina) and allows our trained optometrist to look at multiple layers of your retina in microscopic detail. To create the 3D image an OCT scan uses a laser to scan your retina, therefore nothing touches or blows on your eye, this means that we can use an OCT scan on everybody, no matter how old or young you are. An OCT uses a scanning laser to examine the retina. It inputs the results of these scans into a piece of computer software and the scans are converted into a fully interactive 3D image. The scans can be compared to a cake. When we look into the eye, we normally see only the surface of the cake – the retinal surface. With OCT we can take a slice out of the cake to see all the different layers that make up the retina, focus on a certain sections and pinpoint any unhealthy changes or abnormalities. We recommend that every patient has an initial baseline OCT scan. This will be stored by our software and compared to any future OCT scans for minor, but significant changes to your retina. An OCT scan is particularly useful for any patients who have concerns of Glaucoma, Macular Degeneration and “Flashes and Floaters”. OCT scanning is included within our Private Eye Examination fee and is available as an upgrade for NHS funded patients. After having an operation in hospital to remove a cataract, a follow-up appointment after 2-4 weeks to see that all is well and to decide if any further treatment is required. We are accredited to provide follow-up appointments for patients who have had cataracts removals on the NHS performed by Leighton Hospital. This appointment includes a sight test to see if any spectacles are required postoperatively. Sometimes as a result of a sight test, patients are referred to Hospital for raised eye pressure. Some of these patients will be diagnosed with Glaucoma but many others are diagnosed as suffering from Ocular Hyper Tension (OHT). There is now a community monitoring programme which allows many of these patients to be monitored by their optometrist. patients attending Leighton Hospital or Victoria Infirmary Northwich for pressure monitoring who are not receiving any treatment for eye pressure may be eligible for community monitoring. Please ask for more information. At Jacksons Opricians we provide a full contact lens fitting and aftercare service.Our principles of care and value extend through to our provision of contact lenses. We emphasise the importance of regular checkups and continued advice to all our contact lens patients. At the same time, we maintain our prices at a level which compete favourably with those you see on the internet. Our competitive packages have been developed to meet all of your contact lens needs in a straightforward and professional manner.